The dawning of the Electric Vehicle era is upon us. Fleets of all sorts are adopting or building plans to adopt EVs into service. However, until Multiforce announced the FuelForce/EV Platform, there was no truly integrated system to manage the electricity used to charge ("fuel") EVs as a standard fleet fuel. The FuelForce® EV Platform is a robust fuel/energy management solution is made up of both hardware and software components. The hardware centers around the controller, the FuelForce® 814-EV. The controller provides verification and authentication to allow charging and to monitor and track the charging transaction. Once complete, the transaction is logged at the controller, capturing power consumption for electric vehicle charging by vehicle, driver, site, or department and can include the various utility billing tiers. The FuelForce® Platform is built upon decades of experience in managing fleet fuels of all types, from the standard petroleum based liquid fuels, to alternative bio-fuels, CNG, LNG, and Hydrogen. The FuelForce EV platform adds the management of electricity as a “standard fuel” for fleets with electric vehicles of all types. The implication is that fleet managers have now at their fingertips the ability to manage the fueling authorization and administration of all fleet vehicle types, all from a single interface. Energy Costs for fleets, including those with EVs, is now available in a single dashboard, with the industry's most powerful cloud-based administration and reporting! The FuelForce® web based software, FuelServe.net, allows users to look at their data in real time. 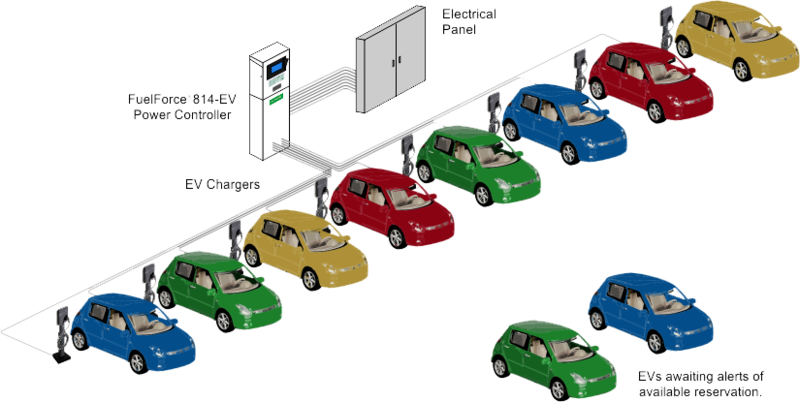 The system collects data from each EV Charging transaction and communicates via network cable or wireless connection to the cloud. This information is then accessed through the user’s FuelServe.Net account on any device using a standard web browser. Authorized users have the ablity of running daily, weekly, monthly, and yearly reports for Billing, Overall Fuel Usage, Energy (KWh) Consumption by Driver, Vehicle, Department, or Site, etc. Reporting and management is integrated for the whole of the fleet, including integrated reports for Evs as well as fuel of all types. PRINCETON, N.J., Aug. 23, 2018 /PRNewswire/ – Multiforce Systems Corp. has announced the launch of FuelForce/EV™, a new line in their suite of fuel controllers, designed to provide energy management and control for fleets or organization charging electric vehicles. Providing Robust Fuel and Energy Management Solutions for Over 35 Years! Our ruggedized controllers are designed and built to withstand the rigors of Canadian winters and Southwest summers. FuelForce® Fuel Controllers only authorize the dispensing of the appropriate fuel to valid vehicles by valid drivers. Fueling transactions are logged with driver, vehicle, mileage, & dispenser hose. The best cloud-based Fuel Management Dashboard in the Industry, providing reports and fuel management on your desktop, laptop, tablet or smartphone.